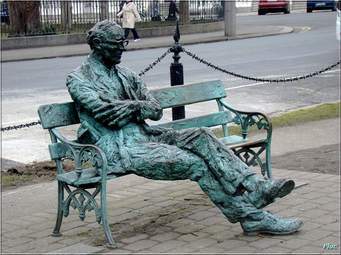 Hartnett bronze by artist Rory Breslin in The Square, Newcastle West. There is a very telling little poem by Michael Hartnett tucked away in A Book of Strays called ‘Aere Perrenius’. 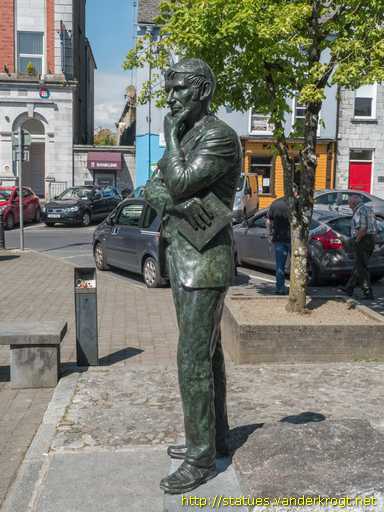 In it the poet recounts early encounters with Patrick Kavanagh after Hartnett had made his way to Dublin, ‘fresh from Newcastle West / at twenty, with a sheaf of verse / tucked into my belt’. It is really a very gentle admonition by the very prescient Hartnett who was already garnering academic interest. He is saying to those who are required, as part of their academic studies, to rummage through the entrails of a poet’s work to be gentle in their excavations. The Latin phrase aere perrenius comes to us from Horace. In the final poem in his third book of Odes, Horace boasts that his poetry will outlive any man-made monument: “Exegi monumentum aere perennius.” (“I have made a monument more lasting than bronze.”). Hartnett would probably have been first introduced to the beauty and wisdom of Horace by Dave Hayes, erudite classics scholar and teacher of Latin at St. Ita’s Secondary School, Newcastle West where Hartnett studied for his Leaving Cert in 1950’s. a life that was and is. let the sad facts stand.